Is It Okay To Charge Guests For a Party? For big events like the Super Bowl, many bars and other places charge entrance. You shouldn’t allow your friends to come over without contributing. This doesn’t mean you have to charge them at the door (though some people do), but you should ask them to bring something to eat, or at least bring their own drink (especially if they are drinking alcohol). It isn’t unheard of to charge people entrance fees to a party, especially if you spent a bit of money trying to get everything prepared. A standard fee for a party is about $5. Of course, you wouldn’t be asking people to bring anything if you are charging them an entrance fee, however, it can quickly add up. For instance, if you have between 20 and 30 people attend your party, you can receive $100 to $150 of what you spent back. Last year, the average American spent $78 celebrating the Super Bowl. That is a lot of money. You, as a host, shouldn’t have to pay all of it either. If everyone who attends the gathering contributes something, each person will spend less overall. Even if it is only a single bag of chips, that is still $3 or more that you are not spending. BYOB and BYOD is totally common. Plenty of people throw parties and ask their guests to bring their own beverages. This is because one of the most costly items for any party is alcohol. 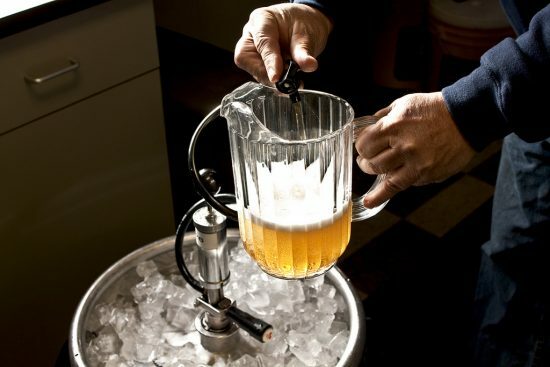 Whether you’re making a alcoholic punch or you’re buying a keg, it is costly. It is also 100 percent acceptable to ask people to pitch in for alcohol. If you get your party catered, you should ask everyone to put money in on the food. For example, if you order pizza, it is acceptable to ask each person attending for $5. You are hosting and providing food, drink and snacks as well as environment so don’t feel awkward about asking for a little help. Also, catering orders for wings from places like Buffalo Wild Wings can get expensive (even making wings is expensive), so asking your friends to help out is okay. Don’t worry, it isn’t tacky, it is pretty common. If you don’t want to bare the burden of the cost of your Super Bowl party, you don’t have to. It’s 2016 and you can ask people to chip in or charge entrance to your house party and it is okay!